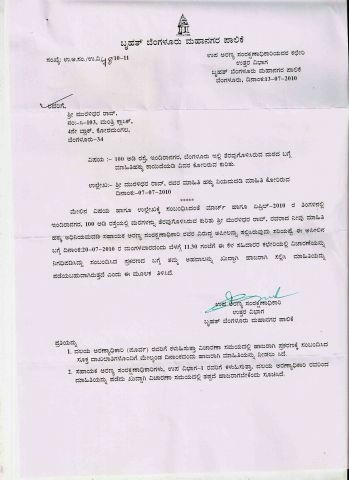 With the BBMP tree officer remaing silent to the RTI query raised by me on the 10th April, in the matter of the apparently unauthorised tree felling on 100 ft road in Indiranagar (check this), I had sent an appeal to the Commissioner, BBMP, on the 28th June. In response, I received the attached letter inviting to a hearing in the matter at 11.30 this morning. I went over and met Mr Krishna, DCF, and Mr E R Ravindra, Range Officer, in-charge of the Indiranagar area, at the BBMP head office. They were extremely cordial, and expressed happiness in citizen activism in helping them check such unauthorised tree felling. Mr Krishna confirmed that the instant fellings were indeed unauthorised, and showed me the notices (under Sec 8 of the Tree Act) sent to the managers of the 'Vodafone' and 'John Players' outlets in the vicinity, and the responses from them, and subsequent notices sent under Sec 144 & 165 of the Forest Act. He further stated that in an earlier case, they had already fined the perpetrator Rs 5,000/-, along with issuing a warning of filing a police complaint, entailing 6 months jail term, in case the offence is repeated. Similar action is being pursued in the instant case also. Mr Krishna was unaware of the High Court order, on consultations with Hasiru Usiru (HU) members before granting permissions, that I had referred to in my query. He stated that he will go through the same, and try to draw up a procedure for implementing the same in future. Perhaps HU and PRAJA can help in the process. Thereafter, I gave him a quick run through on his desk-top on PRAJA's role as a vehicle for 'citizen participation in governance'. He expressed great appreciation, and stated that he will browse through the site to understand it all better. I welcomed him to log-in, and add his comments too, like Mr Manivannan was already doing. He had worked with Mr Manivannan in Mysore, and had a word of appreciation for his work. All in all, a good meeting. Let's hope such interactions will spur the officials into doing their work with greter enthusiasm. But has vodaphone and John Player confessed to cutting trees, or they are saying that they are unaware of it. Murali, Great! keep up the good work! This is truly inspiring work. All it needed was for someone to doggedly pursue the case, & perhaps this is where most of us falter. Hats off to Mr Murali. The DCF stated that it was standard for the shop managers to feign innocence. But, he doesn't let them get away with it, and holds them accountable. I did see a few letters on Vodafone and John Players letter-heads, in the file, apparently in response to the notices served on them. So, some action has been taken. Hopefully, such examples should act as deterrents. And, equally important is the fact that there's a procedure, and if the affected community wants to pursue the matter, the path is clear.